I absolutely love what I do. I look forward to going into the office each day and most of the time it doesn’t even feel like “work”! I enjoy meeting new people and getting to build relationships with them and their families. I’ve always enjoyed working with my hands as well as my head. Being able to use both to plan and guide and shape beautiful smiles and get to see how impactful it can be to both children and adults' self-confidence is awesome. 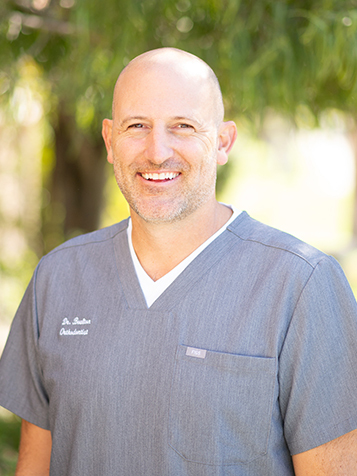 In addition to my formal orthodontic training, I’ve stayed current with the latest materials and techniques to provide the best, most efficient, treatment options to my patients. Originally from Provo, Utah, Cypress has been my home since I was eight years old. My wife Lyndsay and I are the proud parents of seven children: Austin, Autumn, Asher, Aidan, Batri, Ruby, and Conner (and one Grandson). We are very active and enjoy spending time together outdoors and the sporting events in which our kids participate. I like spending time with my family, coaching my kids, dating my wife, and running when I get a chance. With the adoption of three beautiful children, our family has become passionate advocates for orphans here in the US and around the world. I love helping to organize and participating in humanitarian dental trips to provide care to those who need it the most. On a local level, I am involved with the Smile for a Lifetime Foundation, a non-profit organization that provides orthodontic care to individuals who may not have the opportunity to otherwise receive it. I also work with Pathways to Independence, an organization whose mission is to foster profound and productive changes in the lives of young women in Long Beach and Orange County who have been traumatized by their family and abandoned by society. Lastly, I work with Safe Families, an innovative collaboration between area churches, volunteers, and child care professionals designed to support at-risk children and parents in need.